Mucky pastures are a sure sign of spring. Use these handy hints to make mud more manageable. April showers bring May flowers. Isn’t that how the rhyme is supposed to go? In the horse world it often seems that these spring showers also bring the dreaded fetlock deep mud that mires our once grass-filled paddocks. Muddy pastures are more than just an annoyance; they are unsightly and, more importantly, they can cause health problems for our horses. What makes mud such a bad thing? 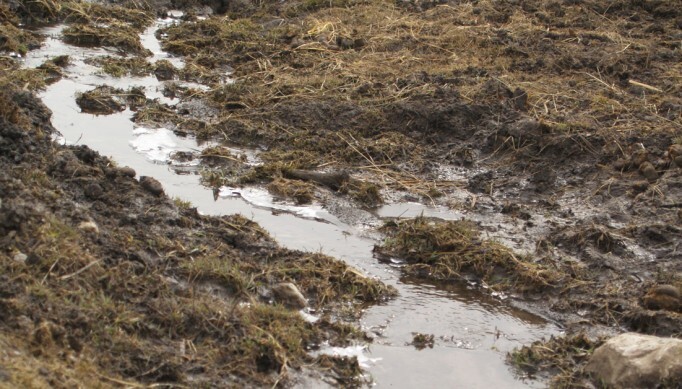 Lurking in that muck are often bacteria and fungal organisms, which can cause such afflictions as mud fever, thrush and hoof abscesses, for example. Beyond that, a simple slip in the mud by a frolicking horse can cause pulled tendons and ligaments or lost shoes. So what’s a good owner to do? 1. Create a sacrifice area. One of the simplest ways to keep your pastures from being destroyed in mucky weather is to develop a sacrifice area where you can turn you horses out. If you have the space to do so, this means finding a small area with good drainage and fencing it off from any other pasture. Sacrifice areas are a region of your pasture that you allow horses to be turned out in during inclement weather; this keeps the horses’ regular grazing area from being churned up into a muddy mess during the wet season. Excellent footing in your sacrifice area is very important because of high use in the most inclement seasons. 2. Examine the footing around high traffic areas. Horse hooves have the amazing ability to cut up the ground that they regularly traverse; the top layers of earth are loosened while the layers beneath are compacted. Add in some horse manure and rainwater and you have the perfect recipe for mud. In the ideal world, horse owners would be able to excavate and install proper drainage in high-traffic areas such as around gates, water troughs and hay feeders, but even if this is not an option for you don’t despair. Adding gravel or sand to these areas can help build up the area and allow it to drain. If you already have an existing mud problem consider adding this extra footing on a 1:1 ratio, that is for every one inch of mud add one inch of gravel or your chosen footing. Wood chips can also work in some circumstances, but remember that they are organic material and will naturally break down and require reapplication. Gutters and downspouts are an easy way to redirect rainwater away from high-use areas in your pasture. 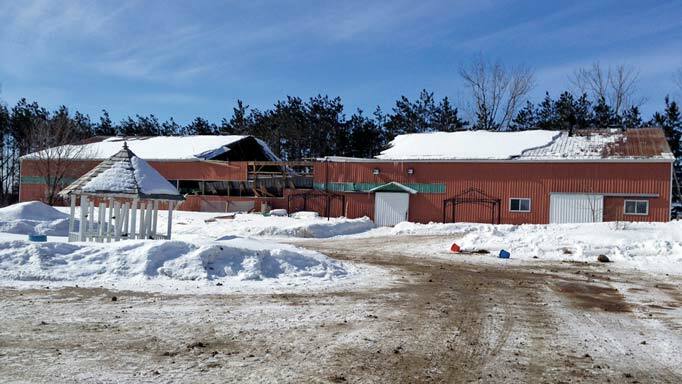 Taking the time to ensure your gutters and downspouts are in good working order, or installing them on your barn if you don’t currently have them are an easy investment to help rid yourself of excessive water. Rainwater can also be rerouted to a rain barrel so the water can be used for other tasks such as watering flowers. This can be a do-it-yourself project, or you can easily find a local installer. There are several different types of drainage systems that you may want to consider adding to your farm. You must take into consideration the layout and topography of your farm before you commit to a particular option. Drainage ditches can be dug around the perimeter of your pasture to help channel water runoff away from problem areas. French drains are also a popular alternative. This type of drain is simply a trench that has been covered with rocks or gravel that allows water to be diverted from a particular area. Perforated hollow pipes can also be added and buried in the gravel bed to help whisk away groundwater. 5. Plant native trees and shrubs. Trees and shrubs have the potential to reduce mud because they absorb a lot of water to live and grow. A mature Douglas fir, for example, can use between 100-250 gallons of water per day! 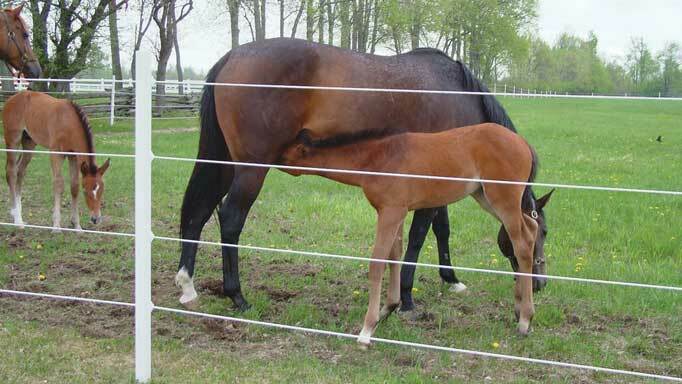 If you are planning to plant trees and shrubs directly in your horses’ pasture, it is important to take the time to fence around them to protect them from curious horses that might be eager to chew on their bark. Adding trees and shrubs will also add to the aesthetic value of your property, but before you start planting make sure all plants are non-toxic to horses. It may take a little extra time and effort to plan on your part to create a better environment for your horse, but with these tips you can help preserve your pasture area and have a mud-free season. 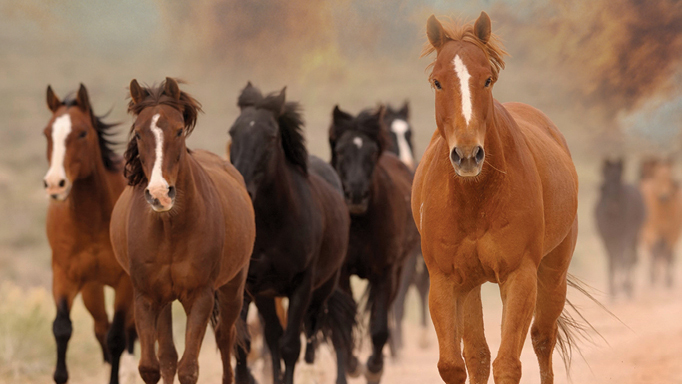 Your horses will thank you for it! 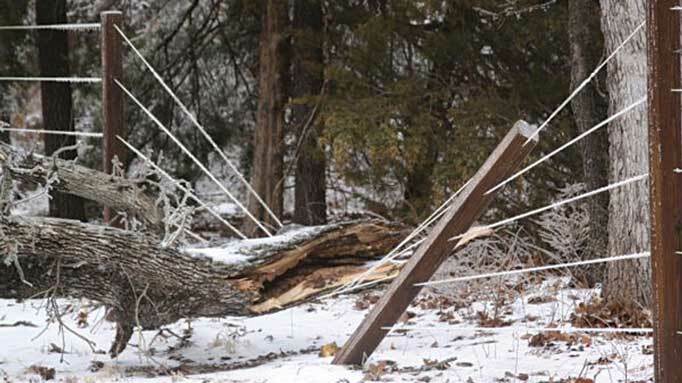 Your guide to sensible disaster planning and emergency preparedness.